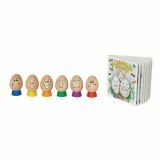 Unique egg-heads help children learn to identify and express their feelings in a fun---and funny--- way. Idea book included. Age: 24+ Months. 13 Wooden pieces.